Well it's November already and now less than 2 weeks before departure. I have to admit that considering we have been planning this trip for 4 years I thought we would have been a little more organised. I'm not saying we are disorganised but we still seem to have a lot of last minute jobs to do, some of which where unavoidable and through no fault of our own. Things really started to hot up just before the September holidays. Much to Chris's disgust we de-registered the Falcon in mid August and I built a mezzanine floor over the top of the car so the space could be used for storage. It was surprising how much we where able to pack in that otherwise wasted space. We are lucky that our house in town has 2 double garages as we have used one to store all our gear in which has left one double garage for the tenants. Anything that could be ruined by mice was packed in the Falcon which included linen, clothes and electrical appliances. You have never seen so much stuff in one car. Hopefully we will have some clothes to wear and sheets to sleep on when we get home. I have assured Chris that mice can't get into a closed up car. Hope I'm right. Then just to put our resilience to the test our tenants from our Elliott Heads house gave us notice that they had bought a house and would be shifting out of ours. What a bugger. They have been great tenants and had planned to be there for years. So right in the middle of packing up our home I had to go down to the Heads on many occasions to attend to a number of small jobs prior to the new people shifting in. And on that note were we lucky. Our agent found excellent long term tenants who shifted in the day the others shifted out. In the meantime Chris continued packing things away. It wasn't a simple packing process as she went through all the kids clothes and got rid of gear that wouldn't fit or be needed upon our return. As we will be away 14 months all crates and boxes were sealed and labeled, batteries removed from all toys and then another bloody garage sale. Boy have I had enough of garage sales. The proceeds of the sale went towards a new digital video camera so I guess it was worth it. I had the easy job of just lugging all the gear down to the shed and trying to make it all fit. The plan was to be out of our house by Monday 7th November and have it rented by that date. Well that also didn't quite go to plan and we had more trouble renting out the town house than we expected. A lot of people wanted it but none passed our agents strict criteria. Not to be fazed we shifted out of the house as planned and started living in the van in the back yard. The things I talk my wife into doing!! We continued to use the toilet and shower and cleaned the house at night. Well you see it was still 4 weeks until we were leaving. So where do we live in the meantime? 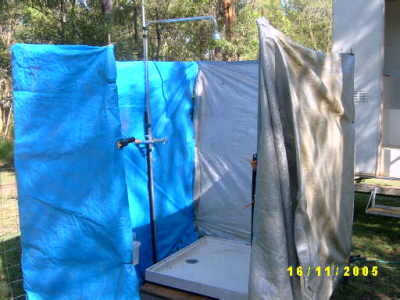 About a month ago we inspected the two caravan parks in town that have ensuites and we were not overly impressed. Some good friends of ours had been saying for months that we were welcome to camp in their back paddock. At first even I thought that was a silly idea but it did start to grow on me. Now for the tough job. Convincing Chris that this hair-brained idea was in fact a good one. That was difficult because I wasn't sure it was a good idea myself. So for this to work and for our friendship to remain intact we had to be totally self sufficient. We would have to tuck ourselves away down the back and do our own thing especially during the week. For it to work there were a couple of issues to deal with. 1/ toilet 2/ shower 3/ power and water. On point one (toilet) there were not many options. One was not to go to the loo for a poo for a month then let it all go at once. Alex thought that sounded OK.
Option 2 was to hire a builders porta-loo on a trailer. It's a beast and holds 634 litres of c---. What a magnificent thought. At the time of writing this it has been 15 days and so far going great. No odour, no flies. I have thought that a fitting thank you to Jon and Sharon for having us for the month would be to open the drain on the loo as I am driving up their driveway. Can you just imagine it. "Thanks for having us. Have left you a little something to remember us by!" Maybe not!!! On point 2 (shower) that was easily solved. I managed to get an old shower base from Alex's tennis coach and I borrowed the small hot water system from the garage at our place at the beach. A few star pickets borrowed from school and a few old tarps, a hand full of cable ties (how did we ever manage without them) and hey presto! A shower. The only bit I had to pay for was the shower tap and rose combination that was $15.00 from the dump. The hot water system is in the car port close to the power and bore water tap and the water makes it's way to the shower via a couple of hoses. It is actually very civilised and is lovely showering while star gazing. Who said I don't spoil my family. And finally point 3 (power and water) were the least of our problems. A couple of drinking water hoses connected together to the rainwater tank and power from the pool pump house. Pure Luxury. Oh yeah, I forgot to mention the beautiful salt water pool only 30 metres from us. 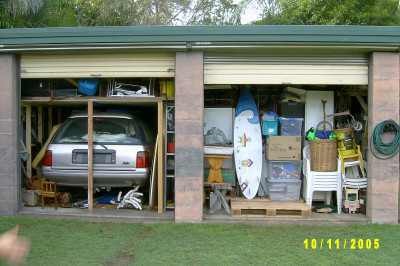 There were many advantages to living here and one was that we are able to store the extra gear that we need at the moment in the Joiners garage. We have our clothes hanging on a temporary rack and in plastic crates. I have also kept a lot of tools so that I can finish off some of those last minute caravan jobs. One of the other advantages is that I can work on the van (Drilling, grinding and welding) without annoying anybody. In the last week before we leave most of this gear will be taken back to the shed in our town house. So there you have it. All our mail can still be sent to Buss St and will be forwarded on until we return in January 2007. Our home phone has been disconnected and we will not have the same phone number on our return. You can rub that one out in your phone number book. Best using the CDMA number while we are away. It will be in the Christmas letter or on our business card that we have distributed. A couple of busy weeks ahead with Christmas parties, kids concerts, Christmas card designing ,writing and sending and finishing off all those last minute jobs. Then maybe we can start to get excited. Our first port of call will be the Sunshine Coast staying at Cotton Tree for 2 weeks then off to Armidale for a few days over Christmas then Broken Hill, down to Ceduna and across the Nullabor to WA. We have no set plan or itinerary and will go where the wind blows us. The web page will be updated as often as we can which will hopefully be every fortnight or monthly at worst. E-mails will also be downloaded as often as possible. Please keep in touch. A wise person once said "The world is your oyster, get out there and you may find a pearl." We're out there Jerry, and loving it.